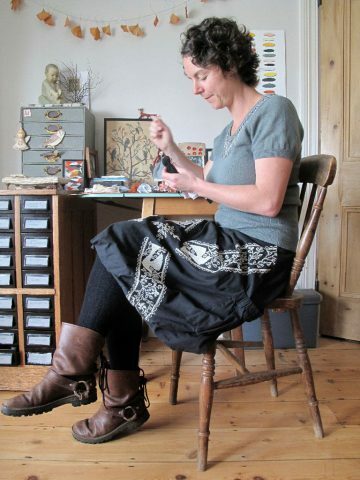 Hello, I’m Sarah – an artist, designer and puppet-maker. Being creative in many different ways is what I do and always have done. I studied fine art at Saint Martins, Exeter University and the National college of Art and Design in Dublin. My Grandma taught me to draw and paint, my mum taught me to sew and my dad gave me an eye for antiques and curiosities. Working at Jim Henson’s Creature Shop in Camden, I learnt some amazing skills from some amazing people and had the privilege to be involved on some fantastic TV and film work including Harry Potter. I’ve recently worked as art director for Komedia Entertainment, on a short film for Count Arthur Strong’s touring theatre show. I make art installations which combine my love of vintage bits and bobs and character work. I’ve made over 200 art dolls, and been featured in Selvedge magazine. You can see the article here.